← Watch of the day. I had my birthday a couple months ago and received a watch. It was not quite me, so I went ahead and bought this one instead. 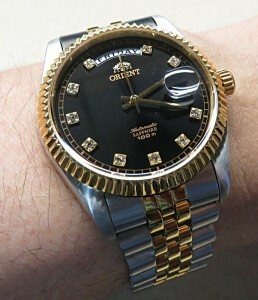 For years I really admired Orient’s homage watches. Sadly, since Seiko now controls Orient, they politely told them to stop producing the Rolex homage watches. This is good and bad. Orient produces some really unique, mechanical watches and I am glad their in house design team is up to the task of producing their own designs. 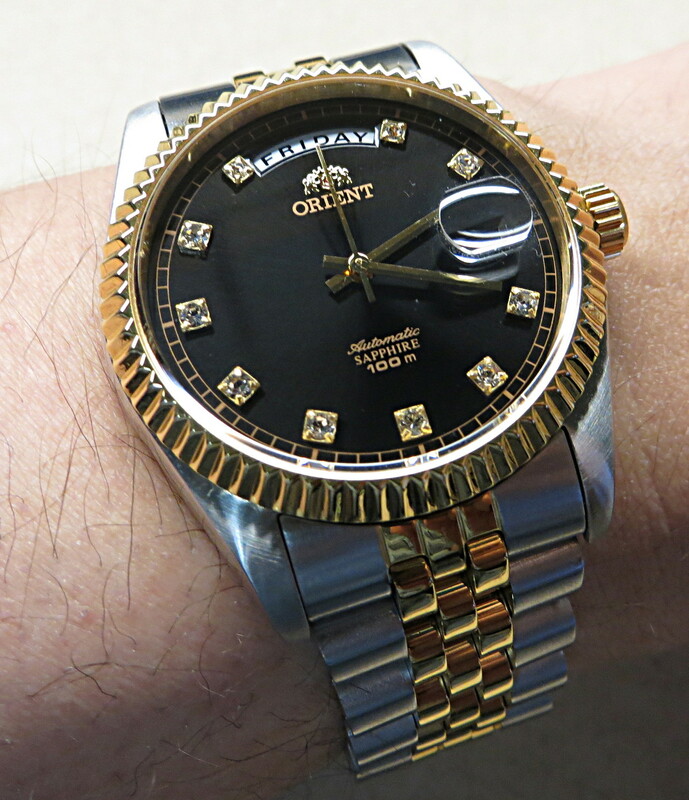 The down side is Orient made a damn good homage watch that could pass for the real deal and in some ways surpassed what they were an homage to. Invicta makes homage watches, but they really stick to the Rolex Submariner and Omega Seamaster lines. In the sub $300 range, there are not too many Datejust or Day-Date homages with sapphire crystals and solid build quality. So, I finally snapped up this watch before they run out of stock. The dial of the watch is a black sunburst, which is a pattern I have not seen before. The hour markers are sapphire, and are at all hours except for the twelve and three o’clock position. They do look like diamonds and are set into gold, applied markers. The minute chapter ring is a simple affair, printed in gold on the dial. The full day of the week window is located between the eleven and one o’clock markers. The date is at the tradition three o’clock position. Both day and date wheels are white, with black printing. The dial is not verbose, which I like. I hate when the dial of a watch is printed like a novel. There is the Orient name with dual lion logo at twelve o’clock; at the six o’clock is Automatic SAPPHIRE 100m in muted gold printing. The hands are simple, gold plated sticks. I wish all three were a little longer, but they are still very visible against the dark dial. The reason this watch is not a fake or slavish homage is the fact the combination of black dial, diamond markers, jubilee bracelet, day-date was never done by Rolex. The crystal is sapphire and flat. There is a cyclops magnifier over the date. It looks to be about a 2.5x magnification. The bezel is gold plated and fluted. Not quite as sharp as the real thing, but very well done. The case is oyster style and very close to the original. It is a small, for modern standards, 36mm. Thankfully the case is also thin, at 11mm, it slides easily under long sleeves. The top of the case is brushed, the sides are very highly polished. 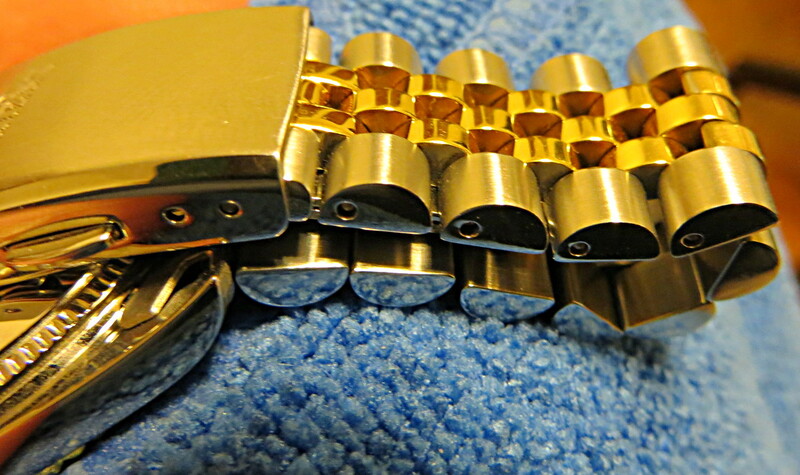 The crown is gold plated, deeply knurled, and screw down. There are no crown guards. The threading on the screw down feature is very well done. 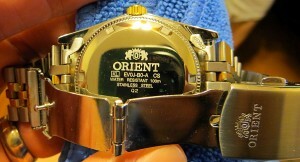 All of the screw down Orient watches I own share this feature. The case back is solid stainless steel and laser etched with Orient, movement and case name, stainless steel, and 100m water resistance. The case back is screw down and has imitation Rolex style case back grooves, but also has the traditional 6 notch indentations for opening the case back. The movement is an Orient in-house design, automatic, with quick set date and semi-quick set day. It keeps excellent time and has over 40 hours of power reserve. The bracelet is very very high quality, solid link jubilee style. Most jubilee bracelets I have encountered are folded links in the center, this has solid links everywhere except the end links. The center of the jubilee is gold plated. The steel is brushed on top, polished on the sides, identical to the case. It is very comfortable to wear and does not rattle or squeak. The deployant is a two button design with no safety. The clasp is embossed with the Orient name and twin lion logo. There are only two adjustment holes, but with the small links, it really does not matter. It defiantly has a better bracelet than most older Rolex watches. I am very happy I was able to acquire this model before it disappears forever. It cuts very close to the original, but is not a fake. The build quality is amazing and it feels a lot more expensive than it is. If you can find this model, or one of the other combinations, grab it while you can. For Rolex lover’s out there who don’t want to pay for the style, this is the way to go. Case: 36mm x 11mm, stainless steel, 100m water resistance. Back: Stainless Steel, screw down, Orient makers mark, water resistance and serial number. Crystal: Sapphire, flat, with magnifier. Movement: Automatic, Orient in-house design and manufacture. Complications: Full Day of Week, Date. Other: Solid link bracelet. Sapphire markers. This entry was posted in New Watches, Watch Review. Bookmark the permalink.